Time for a teen years confession. For about two years, starting on August 25, 1997, my life had about four principal components: sleep, eat, school, GoldenEye. 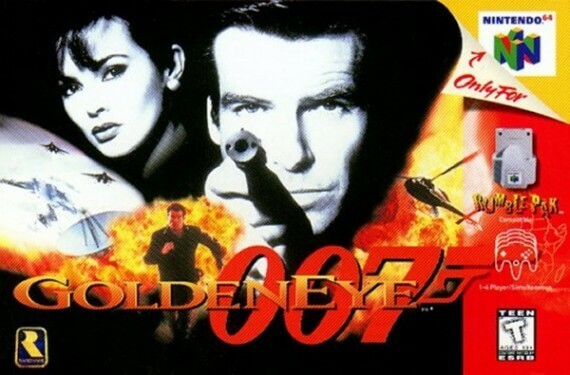 For the uninitiated, GoldenEye was a first-person shooter video game for the Nintendo 64, based on the James Bond film of the same name. And it. Was. Awesome. Widely regarded as one of the most successful, beloved, and influential video games of all time, GoldenEye helped prove that pale, unathletic teenagers and drunken frat boys had more in common than they ever previously dreamed — a shared joy incartoonishly shooting their friends in the face. Playing GoldenEye was its own reward, and I never expected any remuneration for those long, sleepness nights spent playing the game, devouring Oreos by the handful, and listening to Jay-Z’s Hard Knock Life album on repeat (also all true). But it seems I am, in fact, due a “thank you” card from a little-known company called Carl Walther GmbH Sportwaffen. That company — better known simply as Walther — manufactures the PPK pistol, best known as James Bond’s weapon of choice. And no doubt thanks in part to the efforts of obsessive gamers like myself, last month Walther received a rare product configuration trademark from the Trademark Trial and Appeal Board for the design of its iconic gun. That’s right: the shape of this gun is now a registered trademark. Traditionally, trademark protection is accorded to company and product names, logos, and slogans. Kodak — a company name. CyberShot — a product line. “The Best a Man Can Get” — a slogan. The distinctive green-rimmed Starbucks logo. In other words, all of the obvious signifiers of the source of a product or service. So the idea that a product can be its own trademark is definitely unintuitive. Luckily for Walther, though, the company hired lawyers. And as any lawyer will tell you, the law cares very little for your wounded intuition. I was in GameStop last week buying my daughter Hawx 2, a T-rated simulated aerial combat video game. As I was standing in line (with all the dads buying M-rated Call of Duty: Black Ops for their under-17 year old sons, while pretending to buy it for themselves), I was drawn to the display of the Microsoft Kinect, the new hands-free controller that is designed to allow the ultra-interactivity of the Nintendo Wii, but without any controller at all. You (and, apparently, one million of your likeminded early adopter friends) stand in front of a 3D camera system, which translates your movements in real life into the movement of your avatar on the screen. No longer is the pushing of a button or the swinging of a controller rendered as the action of your avatar; rather, your actual fingers, hands, arms, face and body are re-rendered as the action of your avatar exactly as you performed them. Ladies and gentlemen, at long last, the future is here (minus the flying cars, hoverboards, food hydrators, and everything else we were promised in Back to the Future, Part II). I immediately thought of it as acting in a play. The real you is performing the movements from the gallery, while the virtual you is acting them out, in costume and on set, on the stage of your TV. It is like playing cops-and-robbers in the playground, except no one else need be present and no playground is required. Over the last five years or so, numerous state legislatures have passed laws banning the sale of violent video games to minors. In every case, the law was stricken down as unconstitutional under the First Amendment. Seemingly undeterred by such minor facts as judicial unanimity about the constitutionality of such legislation, California too passed a law banning the sale of violent video games to anyone under the age of 18. It used words such as “cruel” and “depraved” to define what was “violent.” And just like every court of appeal that had considered similar laws from other states, the Ninth Circuit Court of Appeal struck down California’s law without hesitation.